Many cacti are globular or ball shaped. Some remain small while others can grow very large. 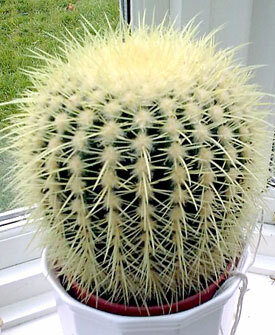 This is a Golden Barrel cactus (Echinocactus grusonii) growing on a windowsill. This is one of the most popular cacti in the UK today, and you can buy small seedlings or larger plants in many garden centres and other stores. Young plants have tubercles (bumps), the ribs only start to grow as they get older. It usually grows well in cultivation, but it needs to be quite old before it will flower. Unfortunately it probably won't flower in the UK. After many years this is what it might look like. These plants are growing in a botanic garden. The giant plant in the middle could well be several hundred years old. 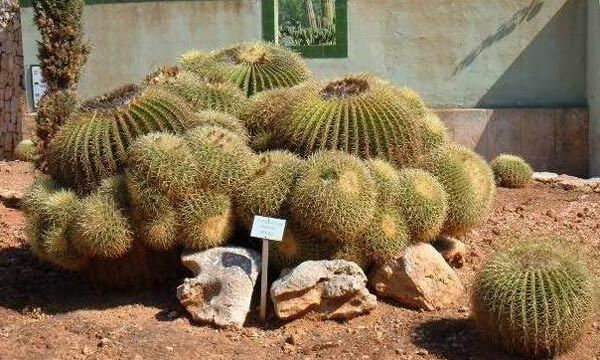 If you buy a Golden Barrel cactus look after it well. They are now quite rare in their natural habitat, much of which has been destroyed by man.